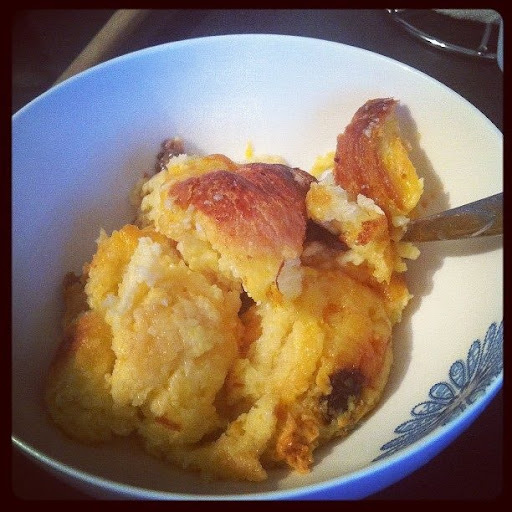 Tune into Radio Carly: Croissant and butter pudding. Definitely a sometimes food. 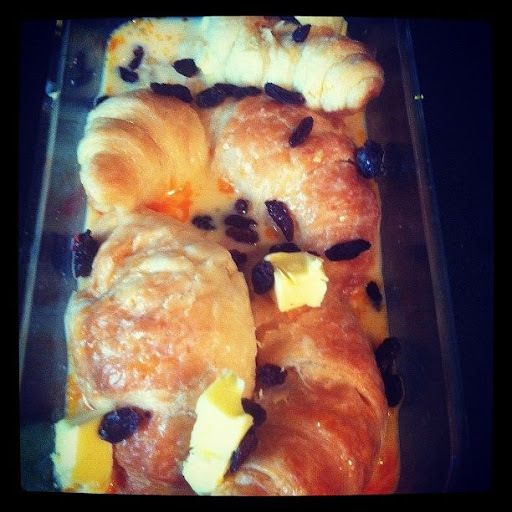 Croissant and butter pudding. Definitely a sometimes food. 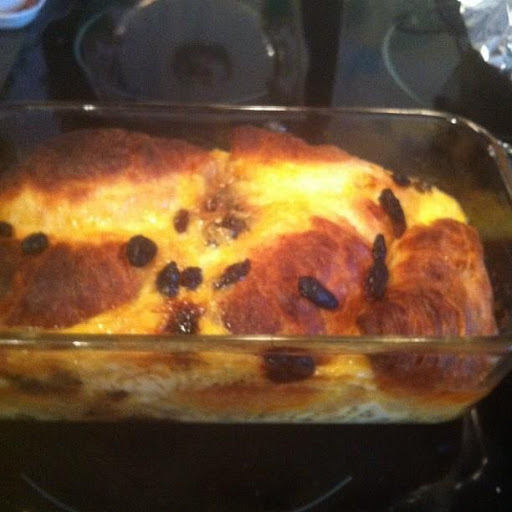 Last weekend I made the best version of bread and butter pudding ever. A few people have asked me for the recipe, and it was so yummy it deserves its own blog post. If you are weight conscious, this probably isn't for you. If you are happy conscious, then this is the perfect dessert. I don't really measure ingredients. I used four croissants, the zest of one lemon, three farm fresh eggs, about half a cup of milk (low fat - is this a saving grace? ), about three tablespoons of sugar, a splash of vanilla essence and a handful of dried craisins. Oh and a generous slice of butter - maybe 50 grams. Beat eggs, milk, vanilla and sugar together in a pyrex (glass) dish. Cut butter into eight pieces. Cut slits in croissants and stuff them with small pieces of butter. Put croissants into eggy mix, and press down so they're soaked. Grate the zest of a lemon and sprinkle over croissants. Do the same with craisins - but make sure they're in the eggy mix or they will burn. Put remaining butter pieces on croissants. Bake in a low temperature oven (150 degrees) for around 20 minutes. When cooked, the croissants will puff up like delicious puddingy pillows. This is a bowl of amazing. You're welcome. I'd make a good little housewife. Nom, nom, nom. Looks amazing. I want to try it but I soooo need to cut back and lose some weight before Christmas when I cannot resist the food. I'm going to attempt to pretend I never saw this. YUM! Might try this, especially because I'm happy conscious! It looks similar to the one they made on Junior Masterchef using Chocolate Croissants - which for the life of me I haven't been able to find! I made it anyway, with regular croissants. With the chocolate sauce it was pure divinity!